Addison Airport, one of the busiest general aviation airports in Texas and the United States, has kicked off construction on a Garver-designed airfield project. The $10.1 million construction project will improve the airfield's runway pavement, lighting, Runway Safety Area, and drainage. Work began April 11, and the first phase involves runway milling, shown above. Runway construction includes more than 20,000 square yards of pavement reconstruction. Because of the airport's high number of operations, the work will be performed in phases to keep the single runway open, and closures will be limited to select weekends. In addition, the project will include an airport-owned precision approach path indicator on both ends of the runway, new high-intensity runway edge lights, a new runway end identifier light on the Runway 33 end, and new in-pavement light bars for the medium-intensity approach lighting system with runway alignment indicator lights on Runway 15. Drainage improvements include replacing the current system with aircraft-rated drainage structures and enclosing an open air drainage ditch with two 66-inch reinforced concrete pipes to stop erosion beneath an adjacent apron. 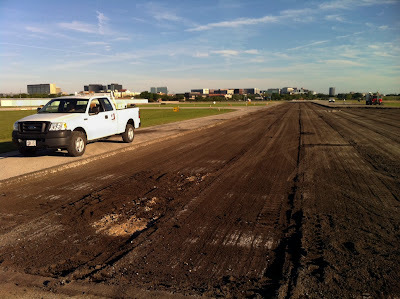 For runway construction updates and progress reports, please visit the Addison Airport blog.